I’m such the observer in this new city. I ride the muni express bus to work (I’ve yet to sit down, and I’m typically scrunched like a sardine as I stand and hold on for dear life)… and laugh to myself because no one talks, and no one gives you any eye contact. Does no one else on the bus think this is funny? And then, the other night I decided to go on a walk from Pacific Heights down to the Marina. It was an amazingly warm night, and I could see the sun setting over Golden Gate Bridge… plus there was a gorgeous full moon. I sighed and thought… yes, this is a fantastic city. But during my walk, I couldn’t help but notice that every girl was carrying a yoga mat. 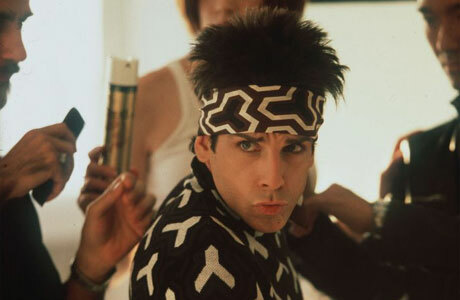 And, any guy that passed me gave me a “Blue Steel” look – made famous by Ben Stiller in Zoolander. Do I need to buy a yoga mat to avoid the stares so I can fit into this city? I’m terrible at yoga.. it actually stresses me out more than it’s intended purpose – to relax me. I’m going to say “no.” And, I’m going to embrace the fact that I’m wearing the color pink today, while everyone else is wearing black and gray. Yep.. I’m an observer, and I stand out like a sore thumb! No need to do yoga… just carry a mat arounds as a prop. Try it on the bus.